American Commitment is a conservative, right-wing 501(c)(4) non-profit organization founded by right-wing operative Sean Noble and led by Phil Kerpen, former vice president of Americans for Prosperity. Its website says the organization's mission is "restoring and protecting the American Commitment to free markets, economic growth, Constitutionally-limited government, property rights, and individual freedom." The group spent millions on "issue ads" during the 2012 election campaign, most of them attacking Democrats. American Commitment appears to have received most of its funding through large donations from a handful organizations with close ties to the Koch brothers. American Commitment was founded by Sean Noble, a right-wing operative with close ties to the Koch brothers. Noble also runs the Center to Protect Patient Rights, now known as American Encore. American Commitment's president, Phil Kerpen, has been affiliated with a number of organizations founded by or with close links to the Kochs, including Americans for Prosperity, the Cato Institute, and the Club for Growth. Between 2011 and 2012, American Commitment received grants totalling $11.3 million from three organizations with close ties to the Koch brothers: Freedom Partners, the Center to Protect Patient Rights, and Americans for Responsible Leadership. An additional $9 million was funneled to American Commitment between 2009 and 2011 through the TC4 Trust. Aside from its own websites, American Commitment runs a slew of other websites that push for conservative policy making. NoMandateTax.com is a website dedicated to the opposition of the Affordable Care Act. The group has created a similar website for the Keystone Pipeline Project at keystonexlnow.com. American Commitment also runs a website that petitions against criticism of ALEC. American Commitment claims that companies who have withdrawn from ALEC, such as Walmart and Amazon, did so because they had been bullied. The organization has a petition that asks companies to stand with ALEC and individuals to oppose the "anti-ALEC bullying." The website is ALECPetition.com. As of June 2014, American Commitment Action Fund (a super PAC that shares an address with American Commitment) had reported $203,666 in spending for the 2014 election cycle. $191,087 was spent on a campaign against Sen. Cory Booker (D-NJ). In April 2014, American Commitment spent $90,000 running ads on Facebook and YouTube attacking Sen. Mark Udall (D-CO) on the topic of the Keystone Pipeline and billionaire Tom Steyer, who has financially supported Democrats. In 2012, American Commitment began running ads for state-level elections. The Center for Responsive Politics found that while American Commitment reported spending "just under $2 million on ads in four races -- the presidential, and Senate contests in Ohio, Virginia and Arizona" in the 2012 election cycle, it likely "spent millions more on ads that didn't have to be reported, because of when they ran and the words they used. ('Tell Tammy Baldwin to stop putting special interests ahead of Wisconsin,' rather than, 'Don't elect Tammy Baldwin,' for instance.)" U.S. Sen. Bill Nelson, D-Florida, ran for reelection in 2012. During the campaign, American Commitment ran ads against Nelson in Florida attacking his support for the Affordable Care Act. But because American Commitment is a 501(c)(4) non-profit, it does not have to disclose its donors. Politifact rated two claims in the video "mostly false," two more "false", and one "pants on fire". U.S. Sen. Sherrod Brown, D-Ohio, ran for reelection in 2012. During the campaign, American Commitment ran ads against Brown in Ohio, and Brown responded to the ads' claims on his website. U.S. Rep. Tammy Baldwin, D-Wisconsin, ran for U.S. Senate in 2012. During the campaign, American Commitment ran an ad titled "Cheating" in Wisconsin, attacking Baldwin for her support of the Affordable Care Act and the Stimulus bill. The ad features a middle-aged man saying, ,"We'll have to borrow money from China to pay for those." U.S. Rep. Martin Heinrich, D-New Mexico, ran for U.S. Senate in 2012. American Commitment ran ads against him in New Mexico. Heidi Heitkamp ran for the open U.S. Senate seat in North Dakota against U.S. Rep. Rick Berg, R-North Dakota. American Commitment ran ads against her in North Dakota. U.S. Sen. Joe Manchin ran for reelection in 2012. He had won his seat in a 2010 special election when Sen. Robert Byrd, D-West Virginia, died in office at the age of 92. American Commitment's ad against Manchin claims that President Obama is waging a "war on coal" and asks rhetorically, "Senator Joe Manchin may vote right, but will he lead others to stand up to Obama?" U.S. Rep. Shelley Berkley, D-Nevada, ran for Senate in 2012. American Commitment ran ads against her in Nevada. In May 2012, American Commitment launched a petition urging corporate members of the American Legislative Exchange Council (ALEC) to continue their membership with the controversial organization. As of July 20, 2012, 30 corporations and four non-profits -- for a total of 34 public sector members -- had publicly announced that they were cutting ties with ALEC because of mounting public opposition to the organization's controversial "model" bills. As a 501(c)(4) nonprofit, American Commitment is not required to disclose its donors, even though it appears to spend much of its budget on electioneering. The Center for Responsive Politics (CRP) has described American Commitment's funding as "especially murky" because a variety of groups with the same name have appeared at various times, and furthermore, "millions of dollars designated for one or another of the groups operating under the name American Commitment seem to have vanished." According to a report by CRP, a group named American Commitment (and another unidentified group sharing the same employer identification number) received over $9 million from the Koch-funded TC4 Trust between 2009 and 2011 -- but that organization appears never to have filed its own tax forms with the IRS. The American Commitment running ads in the 2012 election cycle reported just a little over $200,000 in revenue in 2011, its first year. As the report puts it, "millions of dollars appear to be unaccounted for." A later report found evidence that the earlier American Commitment was in fact a subsidiary organization of the Center to Protect Patient Rights (CPPR). Muddying the picture further, both the CPPR and the current American Commitment were founded by Koch operative Sean Noble, and the CPPR gave the current American Commitment a $1.6 million grant in 2011. No grants reported in 2012. Phil Kerpen, President. Former principal policy and legislative strategist at Americans for Prosperity. Previously affiliated with the Free Enterprise Fund, the Club for Growth, and the Cato Institute. Rachel Marcus, Center for Public Integrity, Nonprofit profile: American Commitment, Consider the Source, August 2, 2012. ↑ Phil Kerpen, Phil Kerpen, personal website, accessed July 13, 2012. ↑ American Commitment, About Us, organizational website, accessed July 12, 2012. ↑ 3.0 3.1 3.2 3.3 Al Shaw, Theodoric Meyer and Kim Barker, "How Dark Money Flows Through the Koch Network," ProPublica, February 14, 2014, accessed June 24, 2014. ↑ Center for Responsive Politics, American Commitment Action Fund, OpenSecrets.org outside spending report, accessed June 24, 2014. ↑ Chuck Todd, Mark Murray, and Carrie Dann, "Obama Inches Closer to More Russia Sanctions," NBC News, April 24, 2014, accessed June 24, 2014. ↑ Rachel Weiner, The latest GOP player: American Commitment, The Washington Post, July 10, 2012. ↑ 7.0 7.1 7.2 7.3 Robert Maguire and Viveca Novak, Center for Responsive Politics, "American Commitment’s Missing Millions," OpenSecrets Blog, April 26, 2013, accessed June 24, 2014. ↑ Alex Leary, Third-party groups spending millions to attack Bill Nelson, Tampa Bay Times, July 12, 2012. ↑ Angie Drobnic Holan, TV ad claims it has 'the facts' on Bill Nelson, then unrolls falsehoods, Politifact Florida, July 11, 2012. ↑ Sherrod Brown, Ad Watch: Reeling From Statewide Criticism Of His Numerous Lies, More Attack Ads Hit The Air To Bail Out Josh Mandel, campaign website, accessed July 13, 2012. ↑ Franklin Center for Government and Public Integrity, $500K ad buy targets Baldwin on health care, stimulus votes, WisconsinReporter.com, July 12, 2012, accessed July 13, 2012. ↑ Sean Sullivan, American Commitment Hitting Heitkamp With Health Care Ad, National Journal, July 9, 2012. ↑ Associated Press, West Virginia Senate: Joe Manchin Gets Go-Ahead For November Special Election, Huffington Post, July 8, 2010. ↑ Associated Press, Gov. Joe Manchin Wins Senate Race in West Virginia, US News, November 2, 2010. ↑ American Commitment, ALECPetition.com: Reject Anti-ALEC Bullying, organizational website, May 2012. ↑ Center for Media and Democracy, Corporations Which Have Cut Ties to ALEC, SourceWatch.org, accessed May 17, 2013. 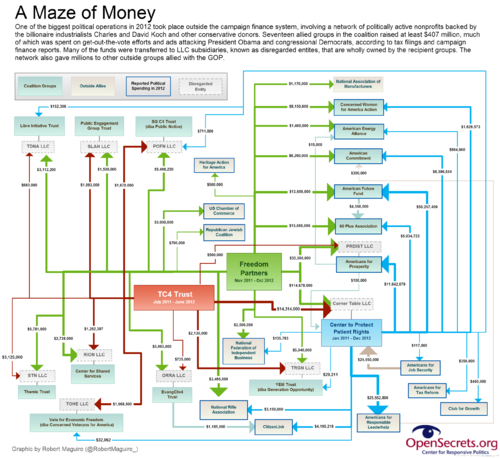 ↑ Robert Maguire and Viveca Novak, Center for Responsive Politics, "Exclusive: Largest Dark Money Donor Groups Share Funds, Hide Links," OpenSecrets Blog, September 10, 2013, accessed June 24, 2014. ↑ 18.0 18.1 18.2 18.3 18.4 Michael Beckel, "Koch-Linked Group Uses Dark Money To Fight Back Against Proposed Disclosure Rules," Center for Public Integrity/Huffington Post, November 20, 2014. Accessed January 5, 2015. ↑ 19.0 19.1 19.2 19.3 American Commitment, 2012 IRS form 990, organizational tax filing, November 19, 2013. ↑ 20.0 20.1 American Commitment, 2011 2011 IRS form 990, organizational tax filing, accessed June 24, 2014. ↑ American Commitment, About, organizational website, accessed June 24, 2014. This page was last edited on 27 September 2017, at 22:45.